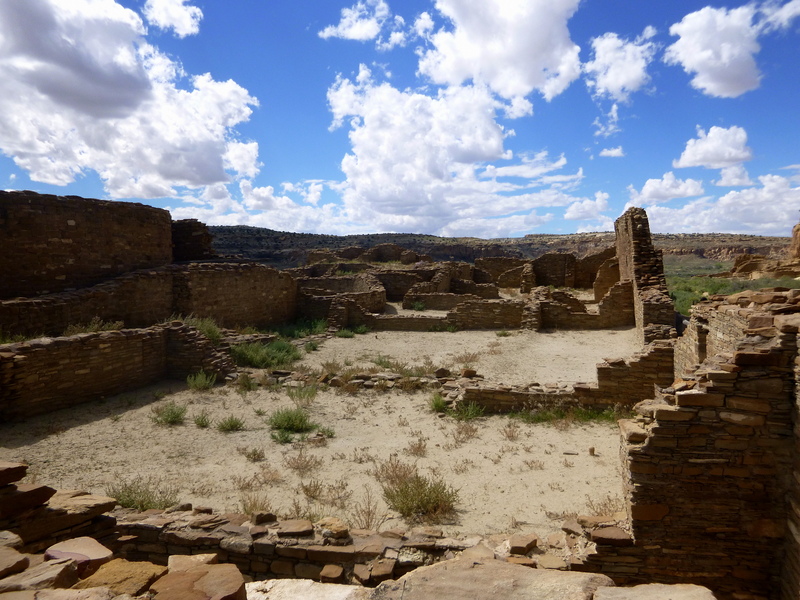 Chaco Canyon was the heart of the ancient Puebloan culture, the epicenter of religious, social, and economic life in the region between the late 800s to early 1100s AD. More than a dozen great houses were constructed here over the course of 200 years, each with hundreds of rooms requiring massive influxes of labor and resources, particularly timber. 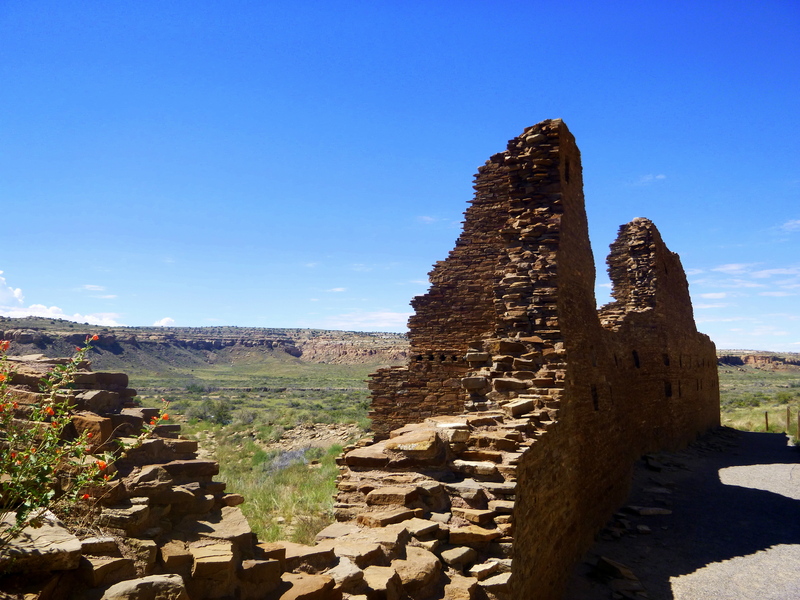 Over 400 miles of roads connected the great houses in the canyon to outlying communities, creating a network that supported trade, connected varying resource areas, and allowed the exchange of knowledge. 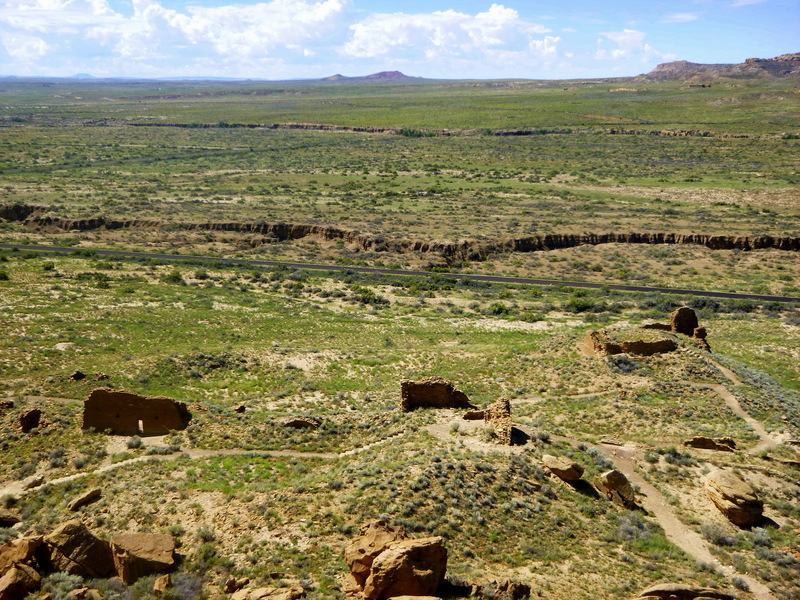 In addition, these roads provided access to what archaeologists believe the ancient Puebloans considered the sacred place. 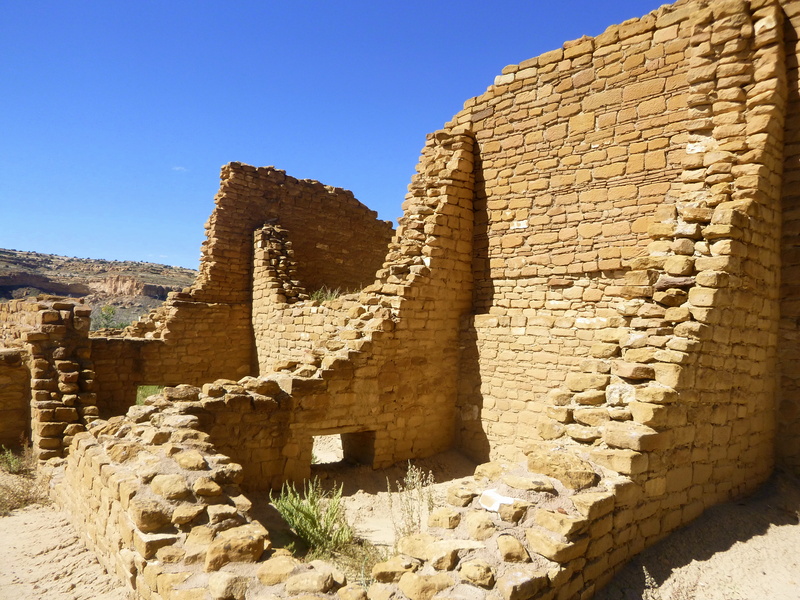 The culture not only survived but flourished in the dry, harsh deserts and cold high mesas of the four corners area because of this highly sophisticated exchange. 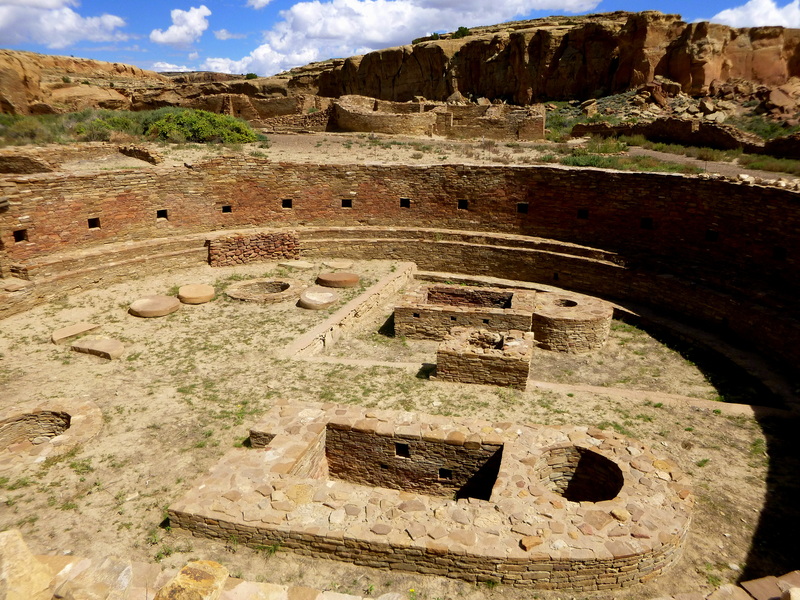 Cultivation, trade, and management of excess food allowed the conditions necessary for the construction of these gigantic ceremonial houses in Chaco Canyon, which survive as a testament to their engineering and the care given to their construction. 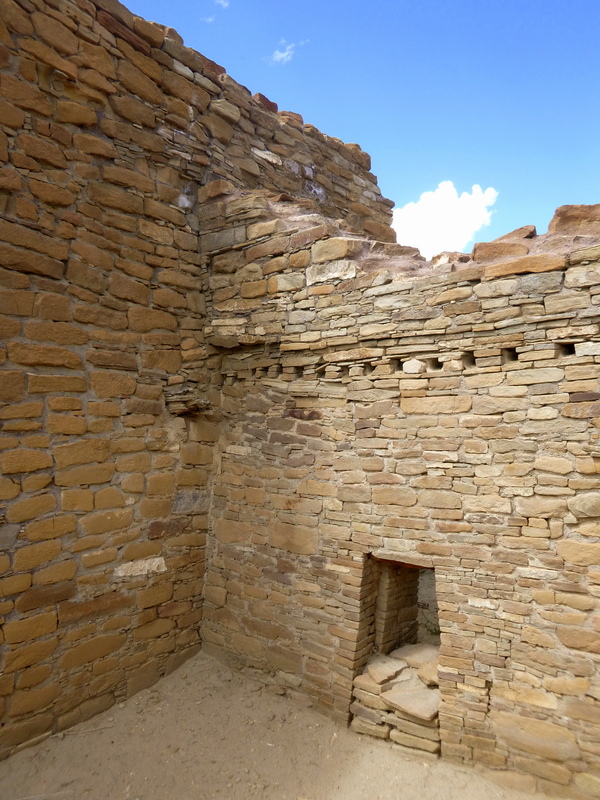 I spent three days and two nights at Chaco Canyon, walking for hours and hours in and around these incredible, fascinating great houses and I feel like I could easily spend double that amount of time there if I were to return now. 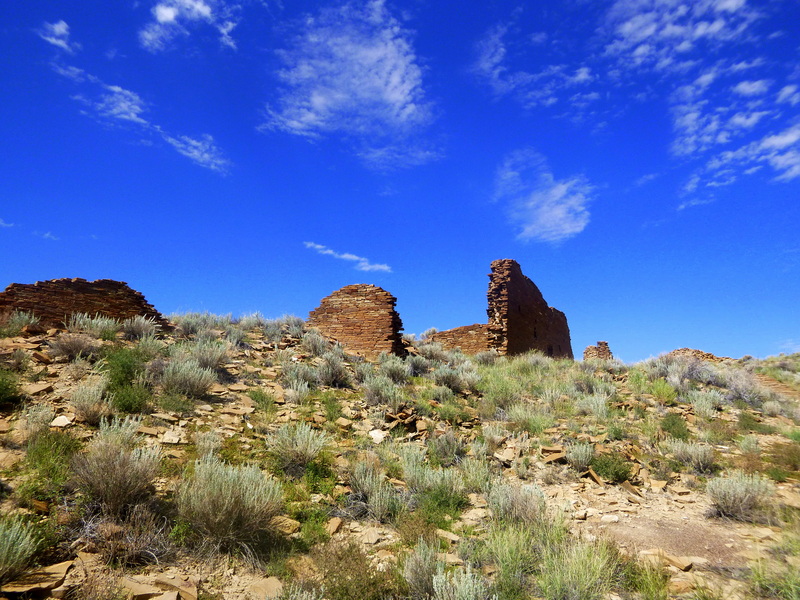 It was utterly mind-blowing to wander on this land, exploring the structures where people ten centuries before had built and administered such an advanced civilization. Oh, and they did it without the wheel. Or slave labor. Or guarantees of a successful harvest from the barren land they inhabited. There is so much we do not know about their culture or about the logistics of creating such a highly organized empire, but what is left is indisputably amazing. 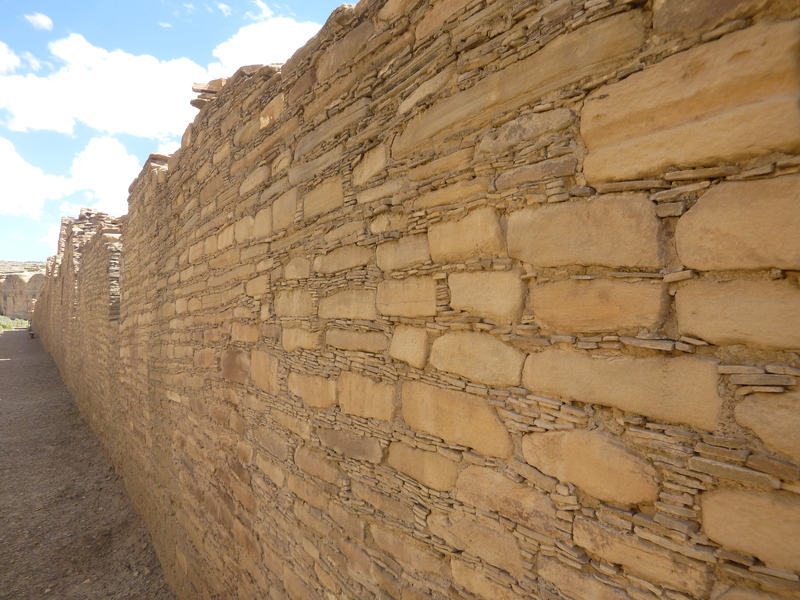 Una Vida, closest to the visitor center, is one of the oldest great houses with construction beginning as early as 850 AD. 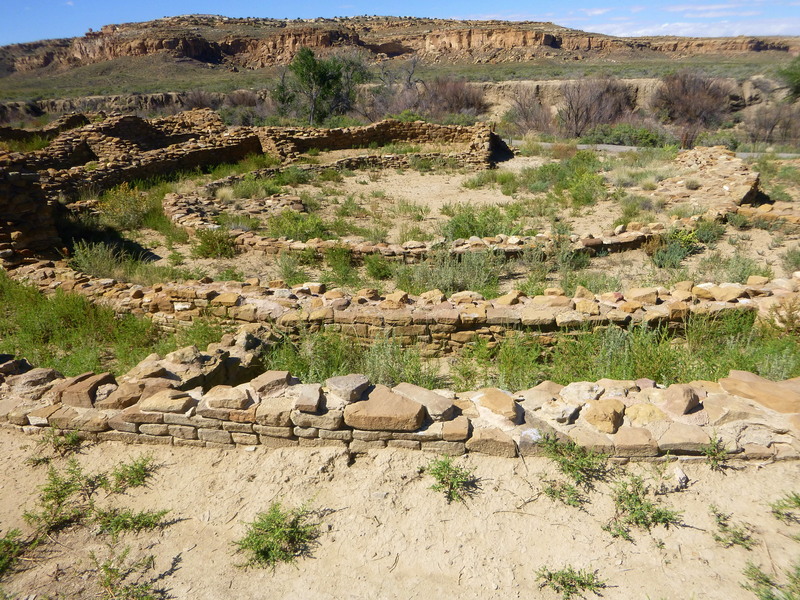 It remains mostly unexcavated, covered in protective sand and vegetation, but the visible walls show signs of the two story structure that was well over 100 rooms. 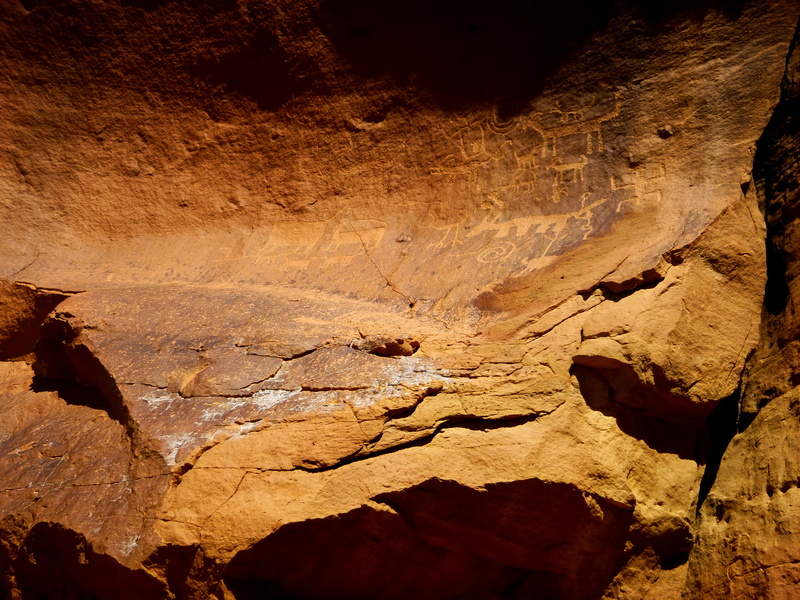 The one mile trail to Una Vida also leads to petroglyphs incised in the cliffs above and provides a view of the site from above. Closest to Una Vida lies Hungo Pavi, a later great house dated to ca. 1000 AD with at least 72 rooms that are believed to have reached up to four stories in some places. Like Una Vida, Hungo Pavi remains unexcavated. 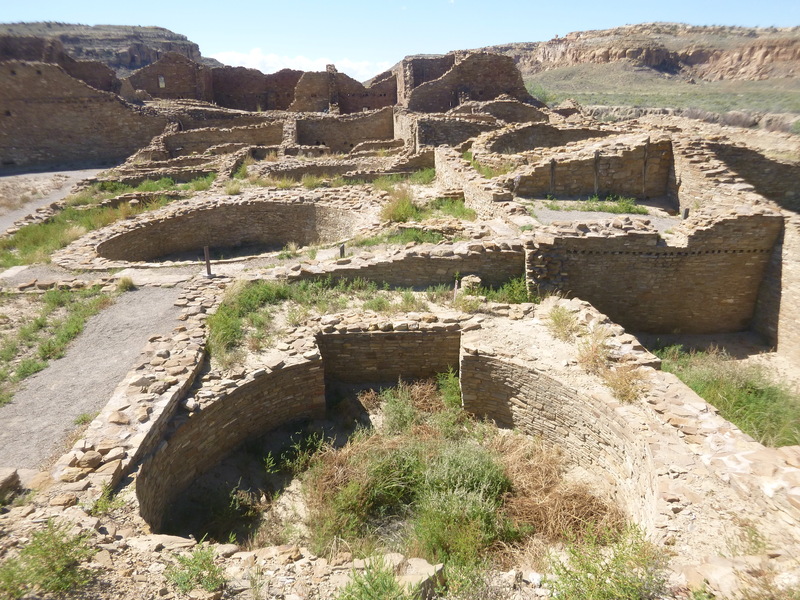 Chetro Ketl appears next as you move north in the canyon, a massive, D-shaped 3 acre great house that features a 63 foot diameter great kiva, multiple elevated kivas, a unique colonnade not found in any other Chacoan structures, and an open plaza raised at least 12 feet above the ground. 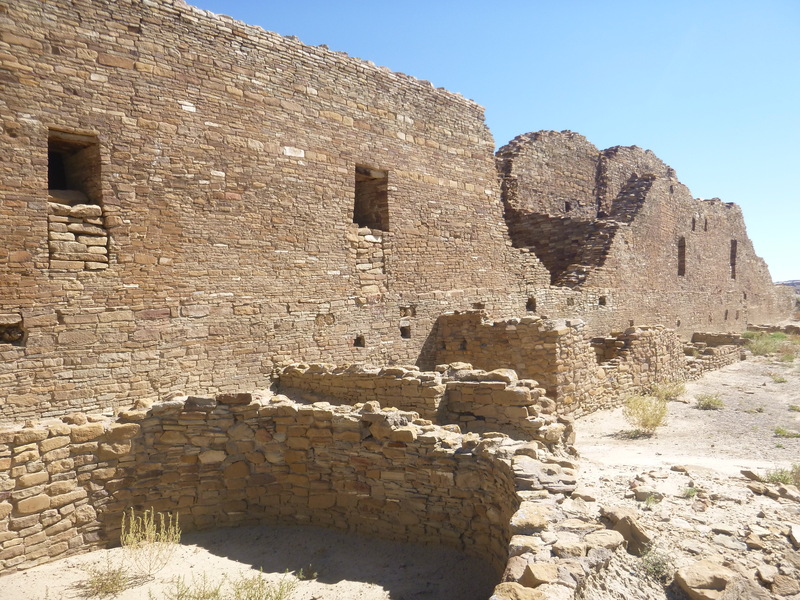 Construction began at this second largest great house just after 1020 AD, culminating in a 500+ room house block with an extensive raised courtyard. 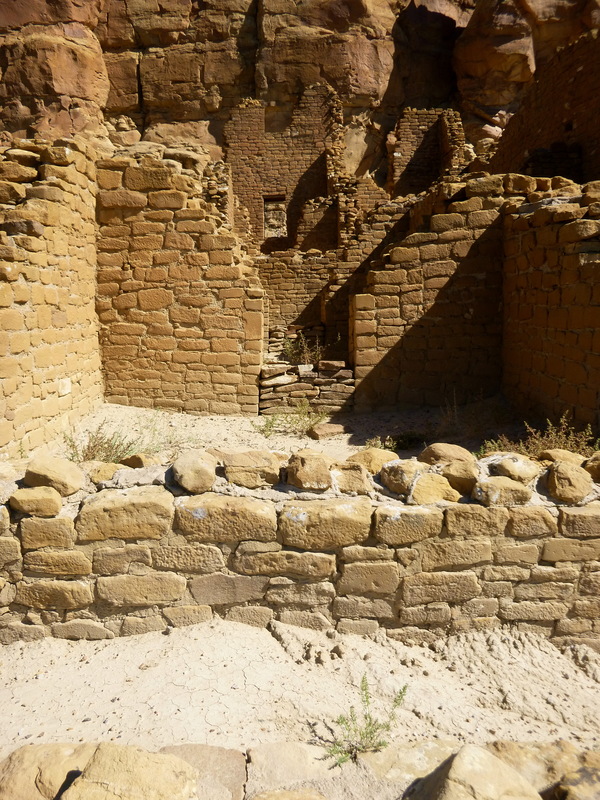 Remnants of plaster remain (behind protective glass) on the walls of the structure, showing a turquoise blue design. 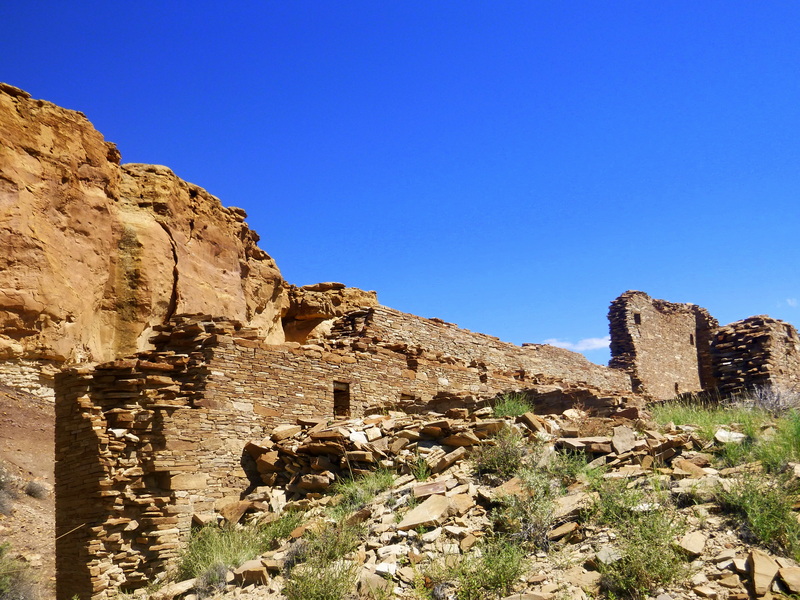 This enormous great house, high above the canyon floor, whitewashed and then covered in turquoise patterns, would surely have been a sight to see in its heyday. It would be difficult in fact to imagine not being impressive to visitors now. Kin Kletso lies farther north, a compact rectangular house block of 55 rooms dating from ca. 1100 AD. 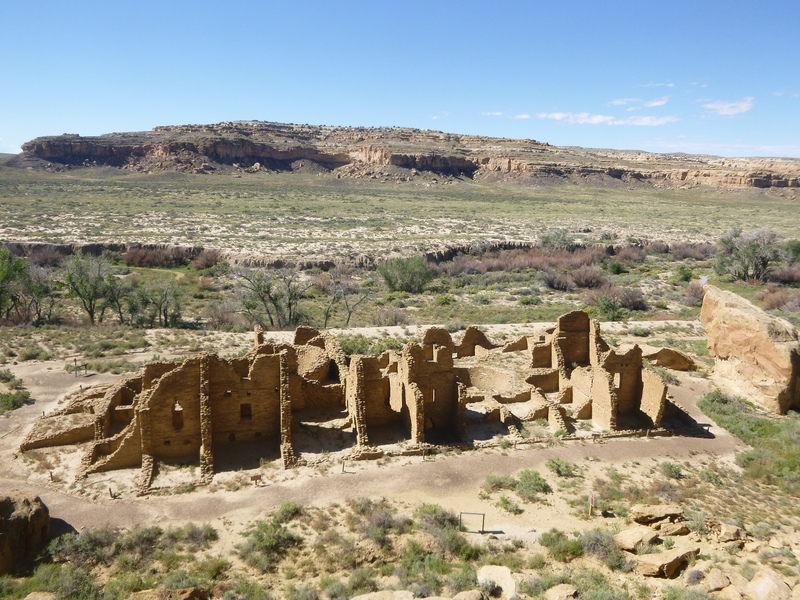 This great house reflects a later style of architecture influenced by peoples of the northern San Juan River Basin, and features larger sandstone block masonry and thicker walls but no D-shaped plan, enclosed plaza, or great kiva. This 100 or so room great house may have risen up to three stories. 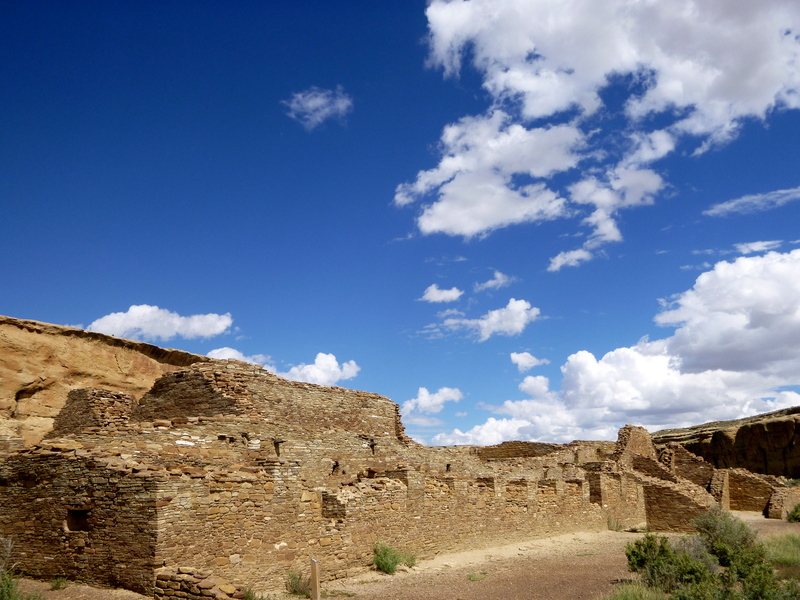 Just south is Pueblo del Arroyo, a D-shaped great house begun in ca. 1075 AD. Although notable for its tri-wall structure, construction near the wash as opposed to the north cliff face, and orientation to the east rather than south, I found the house to be most interesting for its significant remaining timber roof beams. Thanks, Nick. I didn’t know about this place until a couple days before visiting but once I got there I thought the same thing, that I had been missing something important. This place was unbelievable. Ahhh! So great! I’m in love with your posts!